Hi Team Stryker enthusiasts! Today’s page is part 1 of a 2 page spread but due to the way the site is designed I can’t post both at the same time. Luckily this half is awesome enough to stand on its own merits. 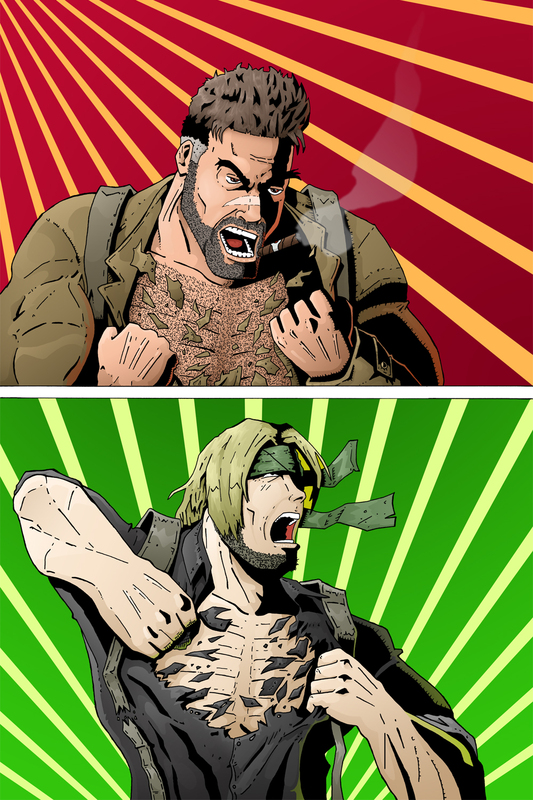 I wanted Team Stryker tearing their shirts off to be more exciting looking than a shoot out with an octopus with 8 guns. Everything in Team Stryker is over the top and getting changed for a mission is no exception. The second half will be up on Monday and if I can find a way to post the 2 pages together I will! In other Team Stryker news my newest batch of paperback comics have arrived! I’ve got Mission 001 and Mission 002 the way they were meant to be viewed: in pristine comic book format. If you are in the Calgary area and want to pick up a copy (or twelve) email me at andrew@teamstrykercomic.com and I’ll let you know where they can be picked up at. If you would like me to mail out a copy let me know and I can send them anywhere else after a payment to the Team Stryker PayPal account has been made.